Did you know that more than 18 million people in the U.S. and Canada have difficulties with mobility? This May marks the first ever “National Mobility Awareness Month.” The National Mobility Equipment Dealers Association, or NMEDA, is teaming up with local communities in an effort to promote mobility and accessibility education for seniors, veterans, caregivers and those with special needs. In honor of the occasion, we’d like to help spread the word! Special Needs Group has a variety of rental equipment available for those with mobility issues, and we’re strong believers that limited mobility should never hinder an individual’s travel or vacation dreams! 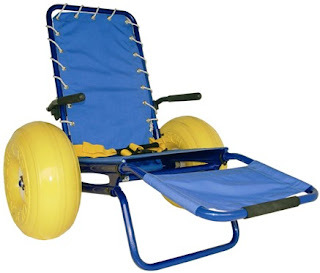 We’ve already mentioned the Neatech Joy on the Beach wheelchair, one of our most popular options for vacation/travel mobility. We also offer a variety of power chairs, wheelchairs, walking aids and scooters to provide the best possible travel experiences for those with special mobility needs. Do you or an individual you know have a particularly inspiring story about overcoming mobility challenges? NMEDA is hosting a giveaway for three people to win a custom wheelchair accessible vehicle. Entries will be accepted until May 13th and winners will be announced sometime at the beginning of next month. Show your support with an entry or a vote at MobilityAwarenessMonth.com! As for our own giveaway, the SNG Education Pays Promotion, we will be announcing our winner on June 21, 2012! For full giveaway details, be sure to visit us online.